The computer genius Kunagisa Tomo and her very normal best friend/sidekick Ii-chan are invited to the island salon of Akagami Iria, a fabulously wealthy ex-heiress who invites the world’s greatest minds to share in her exile. That is, until one is found murdered. On an island of geniuses the normal Ii-chan is the only hope to solve the case, but can he solve a crime when he can’t even understand himself? 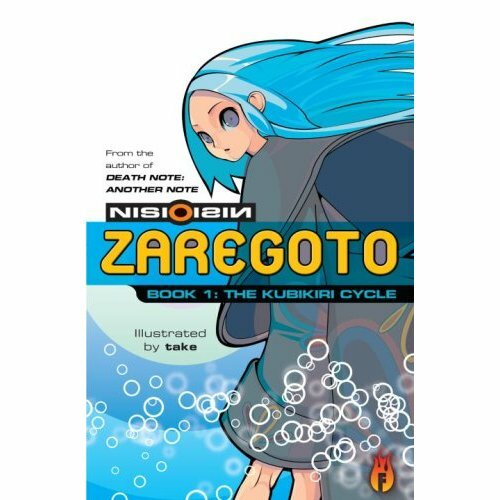 Zaregoto is the long awaited first novel of Nisioisin, the greatest up-and-coming author in Japan, now finally available in English. I’ve already read one of Nisiosin’s other works, Death Note Another Note, and thought that while the msytery was smart the characters just weren’t all that vibrant. Zaregoto fixes this completely as Nisioisin’s allows free reign for his quirky creations and the intricate crime they’re involved in. Quirkiest of all is the apathetic to the extreme Ii-chan. He’s Holden Caulfield turned up to eleven. While half the book is about solving the murders going on, the other half is just trying to figure out what makes this guy tick, with several characters offering their views and not even Ii-chan is sure if any of them are right. Fortunately Nisioisin does all this in a way that doesn’t stop Ii-chan from being a likeable, if baffling, protagonist. Doubly good for me since I hated Catcher in the Rye and everything about Holden in particular. As for the mystery part of the book I found the constant twists exciting and unexpected. Ii-chan’s constant muttering of “nonsense” really does describe the implausible yet plausible crime of the novel. However, I’m not a big fan of mysteries and Nisioisin’s work has been my only encounter with the classic locked room scenario, so more expierenced readers of mysteries than me may not enjoy it as much if they can figure it out, which certainly there are enough clues to figure it out if you think in a really specific way. My only problem with the writing is that there’s no “he said, she said” to mark who is talking. In Japanese the writing probably spoke for itself but English just doesn’t work that way. This is especially a problem when there’s a paragraph break even though the same character is still talking. I was still able to keep up with the conversations, though, even the really fast paced ones towards the end. Despite this flaw and some clunky wording in places I found Zaregoto to be an extremely enjoyable read. It’s an exciting mystery that never forgets it’s the characters that really drive the plot, and it shows how to be anime-influenced without feeling derivative. Really one of the best light novels out right now. I look forward to the second volume in December. Haruhi Novels Finally Snagged by…Little, Brown?